I've been lurking here for quite some time, and have learned a lot from everyone's posts. There are many, many smart, creative people on these forums! I've been tasked with creating sort of an interactive job aid for workers, but am at a bit of a loss with how to do it. The goal is to create a job aid that will provide workers with answers to customers' frequently asked questions about our products. We're making significant changes over the next 6 months, so there will be many things the workers will be unfamiliar with for a time. The goal of the job aid is to help them be able to answer questions while still learning the information as it rolls out. The job aid needs to be something that workers can have as a shortcut on their computer desktop, I've thought about creating something in powerpoint, but I get stuck when thinking how user-friendly it will be. For example, if I create sort of a branching job aid in powerpoint, the worker has to start a slide show that takes up the worker's computer screen to view. How can I structure this job aid, and using what platform (I'm limited to MS Office and Camtasia), so that the worker has something that is easy to use and still has some ability to navigate to the needed information quickly? Hi Hillary! I would consider the audience - will everyone be looking for the same type of info? Or will people have different roles and therefore need different type of info? That might be one way to identify and organize the information. Depending on how frequently you expect the content to change I I would create something that is easy to keep updated. For example, post it online and always keep the most recent version at the same link with a "last updated" note on it. You might also include a means for your audience to provide comments and ask questions. Sometimes the best ideas come from the actual users. Depending on how much content you have the ability to search could be helpful. Here is an example Engage FAQ that has a helpful search function. If Engage isn't an option you would use Word to list the questions which then link to the answers either elsewhere in the same document or wherever you might want to link them to such as a knowledge base, etc. I'm sure others will also have some great ideas too so let's brainstorm and see what we can come up with? Hi Hilary - and welcome to the Forums. Why does it need to be online? Very often, this sort of thing can best be done with a small, paper-based something they have (literally) at their fingertips. Bruce, I'll risk the beating with rolled up blog posts too...but I think Tom would agree that if a good old paper copy does the job best then by all means print away. Sometimes the simplest things work best. One consideration for print is always how quickly will it become outdated. Depending on the scenario, something online that can easily be printed could be the best of both worlds. Hey, Hillary--I've been using Storyline to create a monthly interactive newsletter and have done job aids, as well. My recommendation: decide on the content, think about design and structure and organization (What's most important? Are there different audiences? ), create a design template, and then put the content in. I've found at this point that I end up re-designing the template a bit. Then I have a few people review it and give me their feedback, which I incorporate. Layering the content allows the reader to get to what's important to him or her without having to dig too much. My interactive newsletter template is long and wide, to take advantage of the display screen; the reader can scan the first page to determine all the content and then click the article they want to read; the first page takes them to sub-pages for different sections, some of which have multiple pages, as well. The idea is that the audience can read as shallowly or as deeply as they want or have time for--you can do the same thing with your job aid. I've embedded links throughout to allow them to navigate without returning to the front page, if they want, and there are feedback opportunities on a number of pages. The online nature allows me to update as often as I need/want to, to incorporate more content than paper, and to organize it better for the end user to get to what they need/want as quickly as possible. I know Mike & Bruce suggested paper--but the benefits of online are too big to dismiss. Email me if you'd like : Carin.L.Bigrigg@Verizon.com. There are lots of free Wiki applications out there now, and as far as I know they allow for user comment, and are relatively easy to update and index. Just google "free Wiki". Might be an easy option? 1) Create your vignettes using StoryLine or whatever tool you prefer and publish them to a server where users will have access. 2) Create a StoryLine slide and adjust the size down to only what is required for you to place icons or file names that will be meaningful to the users. Get rid of most/all of the player elements. 3) add the images/text that will serve as the links and link them to the files you wish to launch. Set them to open in a new browser without controls. 4) Use the Publish To CD option. 5) Distribute the file and have users open it and leave it running on their desktops. See this short screenr for more details and an example. Carrying on Bruce and Mike's suggestions I very quickly and roughly threw together an examplet that you could easily create in MS Word and then publish to PDF. It just uses hyperlinks to other parts of the document where the answers to the questions are. Thank you all! You've given me some great ideas! I do know that the the method I use has to be simple and easy to navigate, and easy for me to update, as well. An online job aid will be easiest to for me to keep updated, though I must say that I prefer paper for things like this. I'll experiment with these at work tomorrow and then let you know what I've come up with. I've used a vignette approach successfully in several past projects. We made a list of the items that were critical for users to perform, created a word document "cheat sheet" and recorded a demo which was published as both a "watch me" and a "try me". 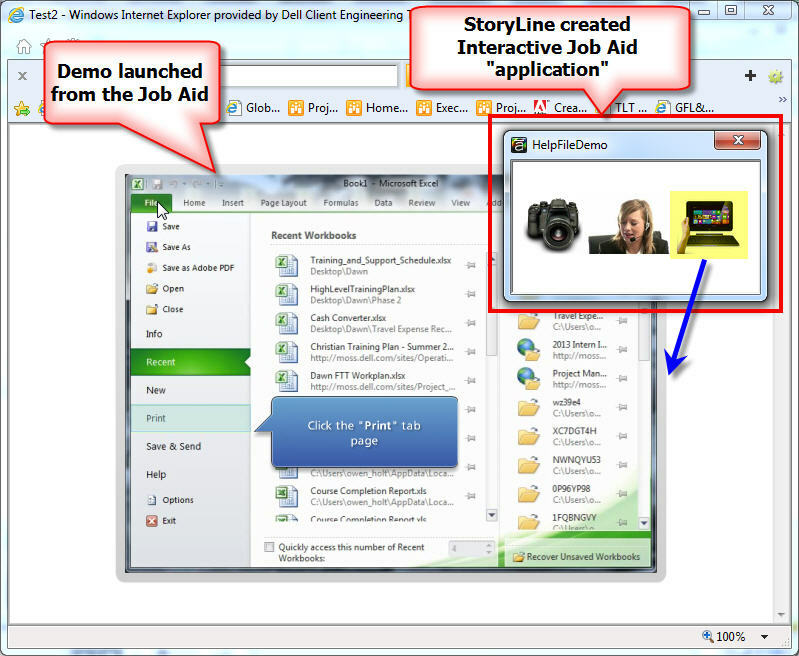 All of this could be linked to from a single website (or as I demonstrated above, a "help desk" storyline application). Feedback was that users loved being able to see the steps being performed and used this the most to learn the steps. They would watch a few steps, pause, then perform them in the new application. Later, they typically used the written "cheat sheet" as a reminder resource for those things they performed less frequently. Regardless of what you do, I'm sure it will be great ! The goal of the job aid is to help them be able to answer questions while still learning the information as it rolls out. I'm pretty sure I know what you mean by "answer questions". But what kind of information are you talking about here? Hi Hillary - as part of your platform, does your MS Office have SharePoint? We created a SharePoint web part page for our new hires and categorized it (it seems similar to what Carin does for her newsletter) so that on the very top left is a list of FAQs and answers, then wiki with a preview pane for definitions is below that on the left (left is easy real estate in a browser), then product updates or alerts in the center, and then hyperlinks to demos/videos/manuals on the right. Everyone in the company has read access to the SharePoint site and our team has contributor rights to update any of the sections we need to. Good luck! Would love to hear how it turns out! Owen, thanks for the helpful "vignette launcher screenr"
Regarding this suggestion (above), forgive my ignorance, but how did the written "cheat sheet" match up to the demo and try it modes. That is, I saw in your screenr how Learners could access the video vignettes from a sort of "mini" menu screen, but I'm not getting the Word doc cheat sheet part. I see WHY you created it, but when you say it was a written doc and the Learners referenced it afterward, what was it like? Did it have lots of written instructions? Was it mostly graphical or icon-based? How did the Learners quickly get to the things for which they needed reminders? "Bruce, I'll risk the beating with rolled up blog posts too...but I ..."
"1) Create your vignettes using StoryLine or whatever tool you prefe..."
How Do I Upload a Job Aid?